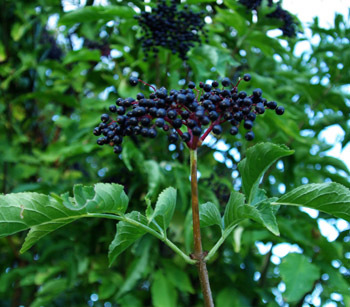 (Black Elder, Elder Berry, Black Elderberry) Perennial, deciduous, multistemmed bush to small tree native to Europe. Wild form. The berries are large and tasty. Traditional usage (TWM): Colds, flu, immune enhancement. Source of anthocyanins, bioflavonoids, vitamins and antioxidants. The syrup, tincture or glycerite of these berries is excellent for treating the common cold and for overall increase in immunity. 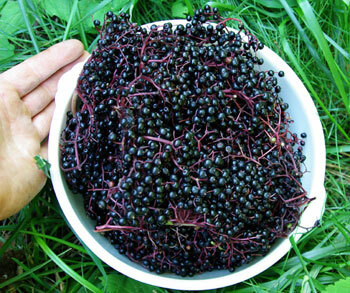 Elderberries prefer rich, moist soil in the part shade to sun. They are best placed as an understory to a higher tree canopy. Cage to protect from deer during first few years of growth. Space trees at least 15 feet apart. How long does Elder take to fully mature? I planted a 2-year-old seedling to the field 3 years ago and it produced a lot of berries this year, so in that case, 5 years. Elderberries grow really fast, and one of the techniques for growing them is to cut back to the crown in the fall of the year. Then, they shoot up about 8 feet and make berries the next year. But this method presupposes a sufficiently well sized plant, which will take some years to establish. Plant some, the years rush forward, and there is no time like now. Do elderberries grow and produce in zone 8a? 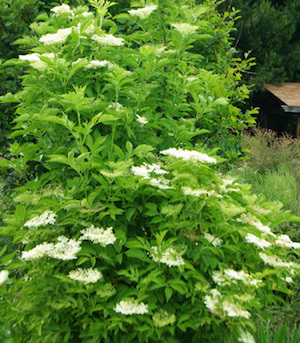 Yes, if you choose Sambucus mexicana. I note that our Sambucus nigra are listed to zone 7 only. I purchased two of these from you 3 maybe 4 years ago and every year it gets maybe 6′ tall and bushy looking but then in the summer- before it ever has a chance to flower- it dies back to the ground. It sprouts back up again a few weeks later and grows a less than its initial seasonal growth but it’s never made berries or flowers. Do you know what is wrong or what I could do to try to avoid this happening again? PS. The first year I had it in amended clay in full sun, just missing the shade reach of the Paulownia it was under. In spring of the second or third year I transplanted it to a shadier patch under a wild cherry tree where english ivy, nettles, mayapples, calendula, yarrow are growing. It is growing in a spot of unused woodchips that had decomposed there for 2 years prior to the planting. This is where it currently sits. It still gets about 6-8 hours sun spring-fall. The plant requires plenty of nitrogen especially in the spring. give chicken manure all around the base and keep it well-watered in and you won’t have these issues. 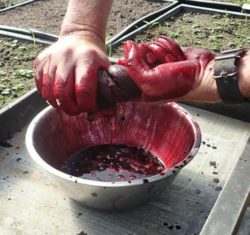 How old are your elderberry plants? So no stock will be available for spring 2019, right?